A few little words can tell a big story about Jesus. Teacher, Healer, Servant, King--Jesus is a lot of things. Now toddlers can learn His amazing story in just 12 child-friendly words. In the Little Words Matter(TM) board books, it only takes a few words to tell a big story. Crafted especially for toddlers, these books make biblical truths easily understandable and enjoyable for little ones and their parents too. 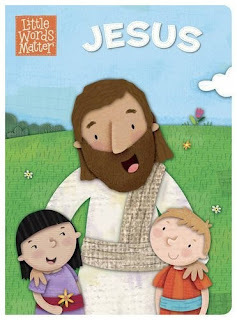 A board book with 24 pages, Jesus is simple with its words and darling with its illustrations. We all have thoughts that come to mind when we think of Jesus and who He is. This book shows young children some of those wonderful words. Healer, king, cross, and tomb are just some of the twelve words depicted to show who Jesus is and what He stands for. One person will win a book copy of Jesus. I would use the word Loving. Cute board book, any kid would love it.